Pudina Lachha Paratha Recipe step by step | How to make mint paratha | Pudina Paratha Recipe. 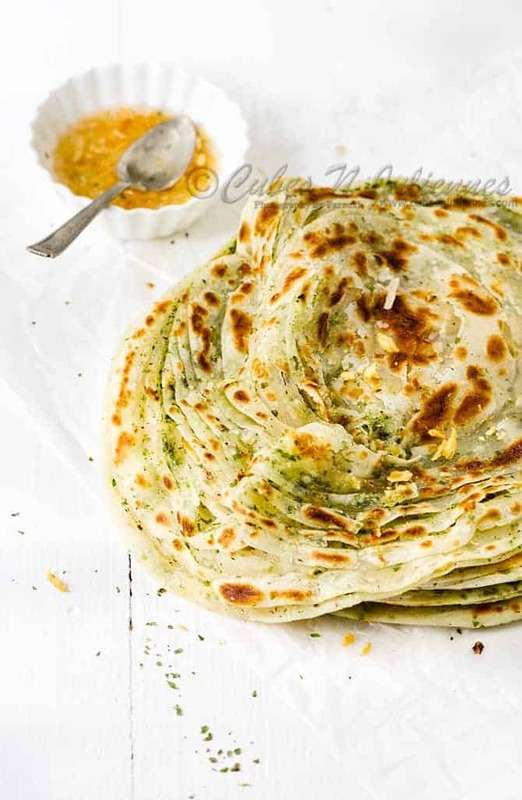 Mint paratha or pudina lachha paratha recipe, an Indian flatbread, is a delicious, crisp and flaky layered paratha flavored with dried mint or fresh mint leaves. As the name says, laccha (lachcha) means “many strands” and paratha comes from parat i.e layers made with atta. Restaurant style pudina paratha recipe makes a use of maida (all-purpose flour) and so is this recipe. If you notice in the recipe below, I have generously used garlic flavored oil to make the layers. So, garlic oil gives lovely punch to it making it crisp flaky lehsuni pudina lachha paratha recipe. Almost every Indian who would have enjoyed meals at any restaurant or a dhaba, would have definitely relished the crisp flaky and soft within pudina lachha paratha atleast once. We all housewives also would have given a try atleast once to make crisp laccha paratha recipe at home. But, there would also have been failures due to dough or rolling issues, or may not come crispy and flaky or any issue for that matter. 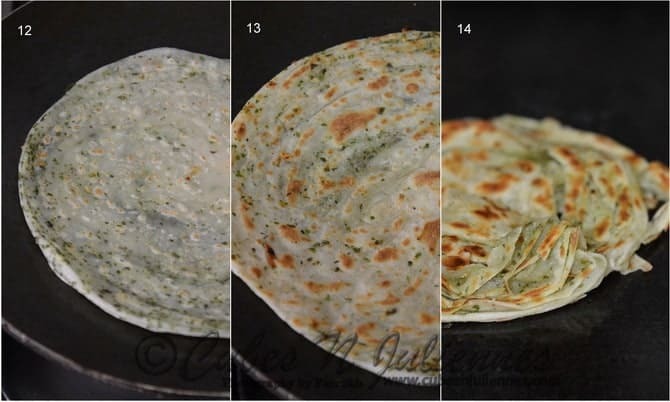 Here in my recipe, I have demonstrated how to make best pudina paratha recipe step by step at home. Definitely, every time, when you will make this mint paratha recipe, it will be a winner always. 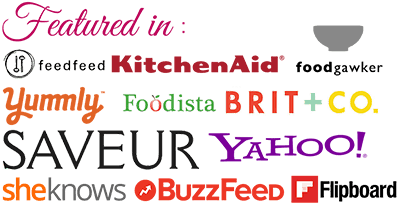 Now, you can also enjoy them making at home and please your family with your skill and talent. Can we use fresh mint leaves to make pudina paratha recipe? In this pudina paratha recipe, I have used dried mint, but you can use fresh mint leaves as well. Thus, you will have yummy crisp fresh mint laccha paratha. To make fresh mint paratha all you need to do is, add 3/4 cup of very finely chopped pudina leaves into the flour (to below measure) and knead. Another important point to remember here is, please use only leaves and discard the stem completely. Be it a dry mint powder or fresh mint leaves, the flavour of mint will blow your mind, once you a start making laccha paratha using it. This Pudina paratha recipe will be at your table frequently, I assure! 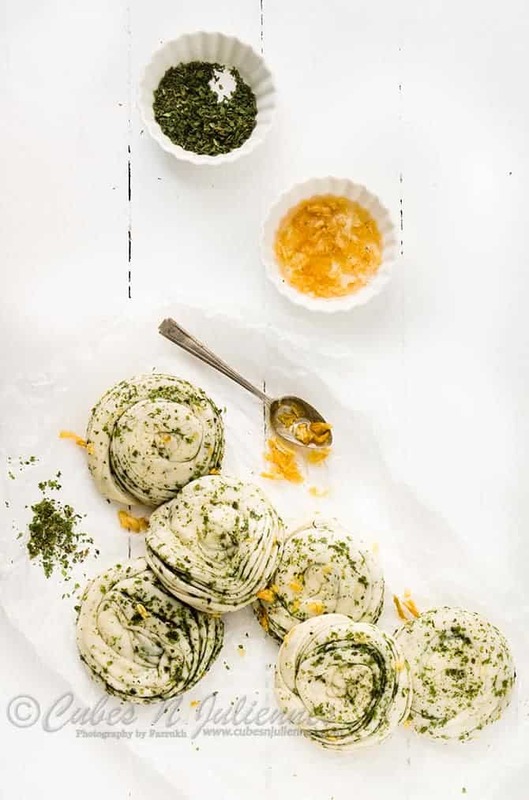 If you prefer a chatpata twist to fresh mint paratha, sprinkle the mix of roasted cumin seeds, amchoor (dry mango powder) or chaat masala and some chilli flakes or red chilli powder. Hence, you will have chatpata masala pudina paratha recipe. 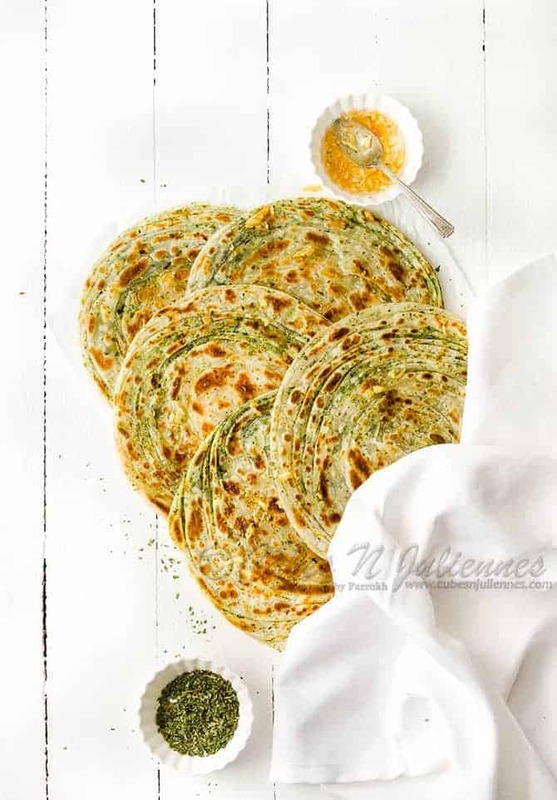 Pudina laccha paratha goes very well with any Indian curry, be it a veg gravy or rich chicken curry. Furthermore, instead of maida, you can use even use whole wheat flour to make Lachha Paratha or lachedar paratha. To make vegan pudina lachha paratha recipe, you just need to skip the milk and substitute it with warm water. Can Pudina paratha be frozen? Yes, indeed, we can freeze the pudina lachha paratha in a freezer upto 3 months easily. 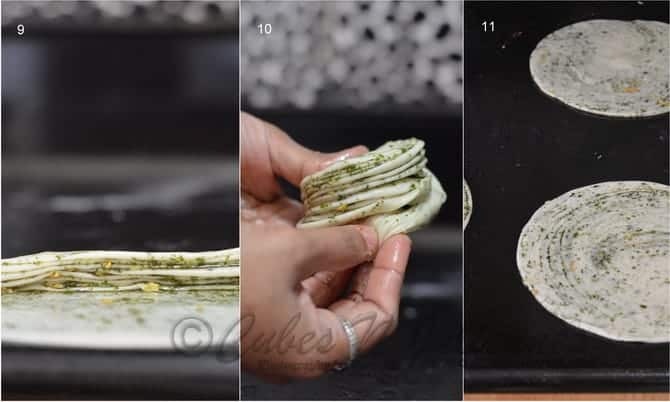 To freeze them, roll all the parathas, then place each on the hot griddle, and cook until just bubble appear on both the sides and take it off the heat. Repeat the same for all the mint parathas, this is called as half cooked parathas. Now, stack the pudina lachha paratha with butter paper or parchment paper in between each of them. Then, place the paratha stack in a clean zip pouch and freeze. Whenever, you want to relish or serve it to the guest, just keep at the counter for few minutes and fry it on the hot griddle using ghee, oil or butter. To make pudina lachha paratha, it very important to knead the dough soft and smooth. Once the dough is kneaded well, do cover and allow it to rest for sometime, preferably 30 minutes. 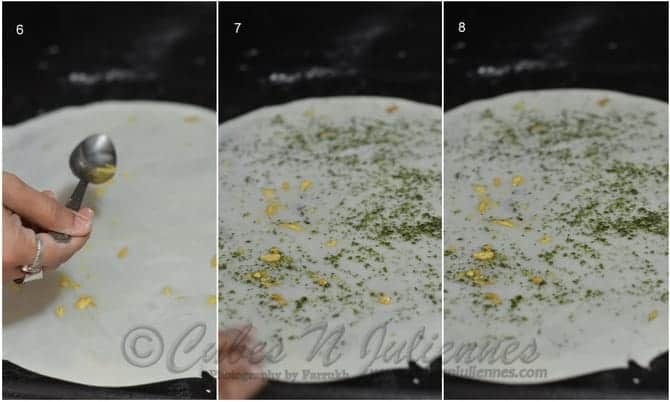 Another key point to make extremely flaky pudina laccha paratha, roll the dough ball as thin as possible. Do not worry, if it tears at any point while rolling the dough thin. At the same time, it is also very important to brush the thin rolled disc generously with oil or ghee. 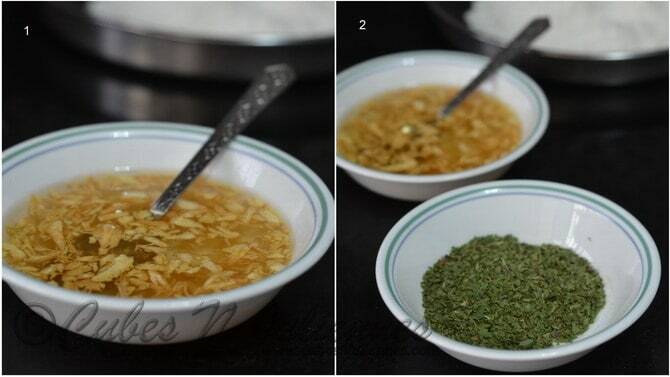 This will not only give you many layers but will also make the laccha parathas crisp and flaky. If you prefer to make plain lachha paratha recipe, you can skip the making of garlic oil step and mint. Instead you have to apply plain refined oil before pleating. To get the best result, following the ingredients and steps exactly is important, then In Shaa Allah you will get them right always. All the best !! Now, make a well in the center and pour half of the milk and start kneading. Do not add all the milk at a time. Add the remaining milk gradually and the dough for 6-7 minutes to until very soft and smooth. Dough should bounce back when made an indentation with the finger. Cover the dough with the damp cloth and keep it to rest for 30 minutes. Meanwhile, in a small pan, heat oil. When oil is hot, add crushed garlic. Lower the heat and allow it to cook till garlic are light golden brown (do not burn it). After 30 minutes, divide the dough in 8 equal sized balls. Cover the balls with damp cloth to avoid drying out. From the one side start making a pleat (creasing) like we do for making a paper fan. Do not make thick /broad pleats(crease), it should be very thin to get good flakes/layers/lacchaas. Many pleats/crease, more flaky lacchas you get. Now, roll the pleated dough, tucking the end below in the center to seal and form the swiss roll. Heat the griddle well. Take one roll and roll it out to 7-8 inch disc. Take it off the griddle, and with both the palms crush lightly from the edges to open up the beautiful layers/flakes of the paratha. Enjoy this wonderful flaky crisp and soft within laccha parathas with kebabs, veg gravy or any Indian curry of your choice. 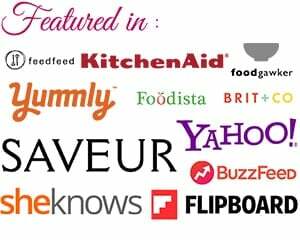 To make vegan lachha paratha, swap the milk with water and proceed. If you wish to make whole wheat lachha paratha recipe, use wheat flour instead or maida or a mix both maida and gehun ka atta and proced with the rest of the steps. Then, cover the dough with the damp cloth and keep it to rest for 30 minutes. From the one side start making a pleat (creasing) like we do for making a paper fan. 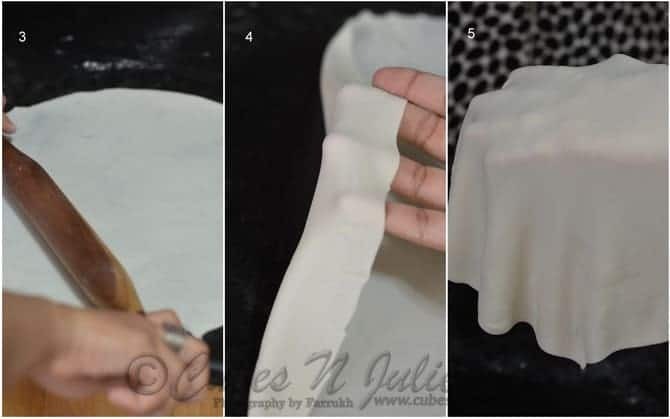 Do not make thick /broad pleats(crease) , it should be very thin to get good flakes/layers/lacchaas shown in Pic 9. Many pleats/crease, more flaky lacchas you get. Enjoy this wonderful flaky crisp and soft within pudina paratha with kebabs, curries/gravies or any vegetable/sabzi of your choice. A perfect way of enjoying parathas.. your recipe made this paratha my all time favourite.. ???????? I have never seen so perfectly crisp lacha parathas with such easy detailed steps. I have gained my confidence back after making these. All thanks to you Farukh.